TYCOKIT No.7762 Exxon Station contains 56-pieces molded in 4-colors. When built, the model's dimensions are 5-1/2" x 6-1/4". This kit was part of the introductory group of TYCOKITS in the 1976 TYCO catalog with the kit number of 7762. The 1977 and 1978 catalogs also label this kit as No.7762. In 1979, TYCO labels the Exxon Station as "NEW" and refers to its number as 7757. It certainly appears to be the same kit regardless of whether it is numbered 7762 or 7757. TYCO does change numbers on some kits during the run of the TYCOKITS product line. Additionally, this kit is one that can be found with a light kit included. The kits with a light kit included added a 'B' to their number. The Exxon Station with light kit is 7757B and/or 7762B. It originally carried a $3.00 retail price in 1976. 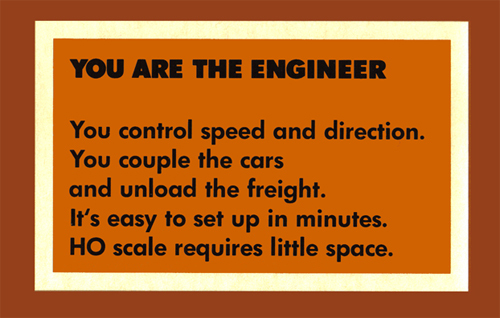 In 1982 and 1983 TYCO offers three building kits in its US-1 Trucking product line. All three kits are taken from the model train TYCOKIT series. The US-1 Trucking Mobil Truck Station (No.3782) is the same kit as the TYCOKIT Exxon Station (No.7762 and No.7757). As a US-1 Trucking Building Kit, the Exxon Station switches its affiliation from Exxon to Mobil thanks to a different sheet of decorative stickers. 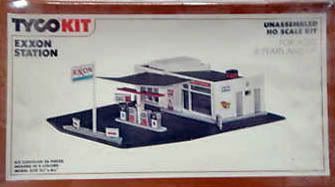 The Exxon Station kit has been available since TYCO's exit from the HO-scale model train business in 1993. 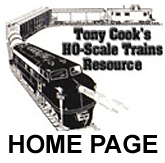 Newer runs of the kit have been available from IHC-International Hobby Corp.